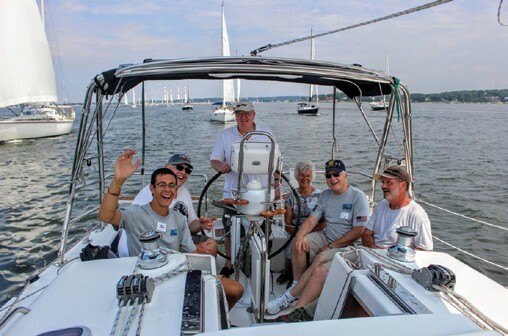 SailAhead’s second annual “Let’s Take a Veteran Sailing” event, hosted by Centerport Yacht Club in Centerport, New York on Saturday, July 30, 2016 was by all accounts a rousing success! With the strong support of Greenlawn American Legion Post 1244, 340 U.S. Armed Forces veterans, skippers and guests participated. Founded by my older brother Kilian and I in 2013, SailAhead is a non-profit organization that uses sailing and the ocean as a form of therapy. Many veterans feel neglected upon returning home, and SailAhead’s mission is to dispel these feelings among veterans and to save lives. There are at least 22 veterans in the U.S. who end their lives daily out of a sense of hopelessness and desperation. At SailAhead, we are very proud to say that we have saved lives. 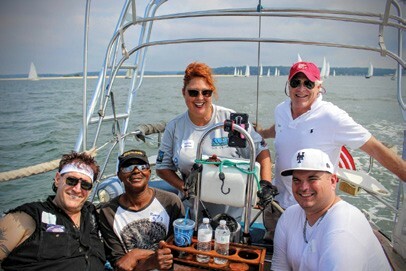 Sailing as a group provides veterans with a comradeship not unlike the one formed in the military. It creates a family-like atmosphere in which you have a purpose, and there is a team with you who will “watch your six.” Too many veterans leave the military with a deep, unsatisfied yearning to once again be part of a team and have friends who can watch their backs. Through sailing they find this, as well as a purpose – they have a job on the boat that their team can’t function without. SailAhead’s second annual “Let’s Take a Veteran Sailing” event had more than 50 boats participate from near and far, with over 145 veterans and their guests. 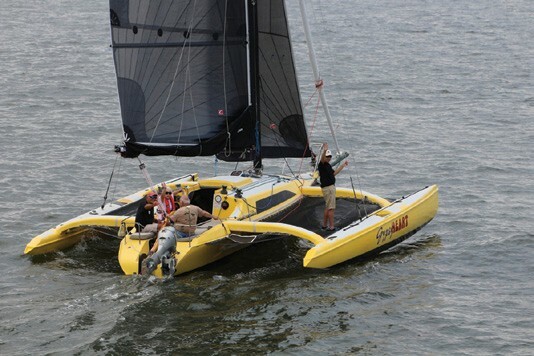 During the sail, a helicopter flown by pilot David Windmiller took aerial pictures and video. Its participation enhanced the quality of the event. Back on land, all were invited to a barbecue at Centerport YC, and the low flying helicopter became the topic of many conversations! Arizona Iced Tea provided drinks and t-shirts for the event, and Sabrett provided many hot dogs for the sailors. George Eshleman, a veteran who has hiked the Appalachian Trail from Georgia to Maine to spread awareness for PTSD, was the special guest of the event. George carries the dogtags of male and female veterans who have taken their own lives because of PTSD. SailAhead has duplicates of the original 218 dogtags. We keep them on our fleet’s flagship permanently, so that during every sail the spirits of 218 fallen warriors can spend time on the water. A local father, who lost his son to suicide after he served in the Marine Corps, gave the son’s dogtag to SailAhead and another to George. Now, every SailAhead outing will be watched over by 219 veterans whose families wish to have their memories live on through SailAhead. Let’s Take a Veteran Sailing brought the community together for a common cause: the protection and preservation of the mental health of the heroes of the United States of America. SailAhead is a healing organization and we alone cannot help everyone, so this event was a great way to get more people involved so that more people can be helped and more people can help. On Thursday, August 4, we held another event with some of our partners, the Long Island Maritime Museum in West Sayville and the Snapper Inn in Oakdale. A group of vets spent a few hours at the museum, went for a sail on the museum’s 130-year-old oyster sloop Priscilla, and enjoyed a lunch at the Snapper Inn. SailAhead’s other partners include the Northport Veterans Affairs Medical Center in Northport, The WaterFront Center, Oakcliff Sailing, and Oyster Bay Marine Center in Oyster Bay, the USMMA Sailing Foundation in Kings Point, pilot/photographer David Windmiller, photographer Laurent Apollon, and of course Centerport Yacht Club and Greenlawn American Legion Post 1244. For more information about how you can support our mission, please visit sailahead.org. Seventeen-year-old Sean Duclay is a student at Walt Whitman High School and an enthusiastic Hobie Cat sailor.